FILE - Zimbabwe soldiers are placed where police are clashing with protesters over fuel hikes in Harare, Jan. 14, 2019. The U.N. human rights office is calling on Zimbabwean security forces to stop their violent crackdown on people protesting the government's economic austerity measures at a time when commodity prices continue their upward spiral. U.N. rights officials say Zimbabwe is in a socio-economic crisis, a situation that will not be resolved by violently repressing large-scale protests. Since the protests began Monday, the U.N. human rights office says violence on both sides has increased. 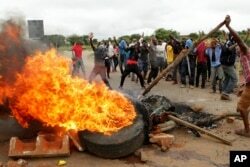 It says some protesters reportedly have burned tires, used rocks to barricade roads, and looted shops and businesses. However, it says these actions pale in comparison to the crackdown by the government's security forces. FILE - Protesters gather near a burning tire during a demonstration over the hike in fuel prices in Harare, Zimbabwe, Jan. 15, 2019. Spokeswoman for the High Commissioner for Human Rights Ravina Shamdasani tells VOA the forces have been using live ammunition to quell the protests, resulting in deaths. "We do not have verification of the exact number of people who were killed or injured, but there are doctors' associations that are putting numbers out there," she said. "Like more than 60 people were treated in hospitals for gunshot wounds. This is not the way to react to the expression of economic grievances by the population." The U.N. agency is calling on the government to set up a national dialogue to find solutions to the economic challenges. It says state authorities must allow people to exercise their right to freedom of expression and to protect their right to peaceful assembly. It is urging the government to carry out investigations into all reports of violence and to make sure those guilty of a crime are held accountable.